This Tuesday a true Focaccia Face-Off will take place within the walls of the famous Mercato Centrale at Cucina Lorenzo de' Medici! In our recently opened Cucina Lorenzo de’ Medici the event entitled Lights, Camera & Focaccia will challenge participants to show their best focaccia-making qualities. LdM’s Event Planning students, who were responsible for the entire organization of the event, have made sure that the morning will be filled with fun and interesting events. The journey takes off with a focaccia cooking course by Chef Gennaro Napolitano. Then a guided tour among the artisans of taste will follow with a film projection on the power of genuine food. 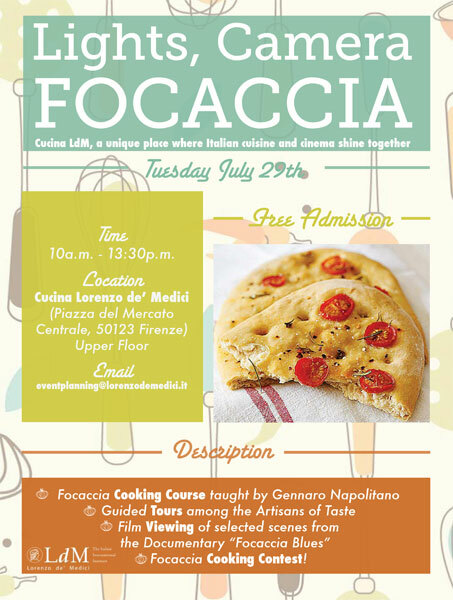 Final part of the event will be a focaccia cooking contest with a reward for the most tasteful and creative focaccia! So you think you can bake? Sign up now by sending an e-mail to [email protected], with the subject line: “participation to LdM cooking event”. Places are limited, so book early! LdM is registered and authorized in Italy by the Ministry of Education, University and Research (decree dated December 2, 1989). Copyright © 2005-2019 Lorenzo de' Medici. All rights reserved.